The cleaning product warning label is sometimes the only information we have about product ingredients. Because of trade secret protection laws, cleaning product manufacturers are not required to provide a complete ingredient list on their labels. Therefore ingredient lists are often incomplete or missing altogether. Product warning label signal words are terms that consumers can use to determine the immediate toxicity of a product. They help answer the questions: How dangerous is this to me while I am using it? What do I do if it's accidentally splashed on my skin or eyes, inhaled, or ingested? If there are any toxic chemicals in the cleaning solution, they will be included on the warning label so that you can give poison control authorities the information they need to assist. Signal words do not tell the consumer about the long-term effects of use; risks related to cancer,liver hormonal/endocrine or reproductive effects. This means that a product is highly toxic and may cause irreversible damage to skin or eyes (including blindness). If it is highly toxic, and may cause death if accidentally inhaled or ingested, then the word POISON is normally included on the label. Danger is also used to indicate if a product or package could ignite or explode when exposed to heat or an open flame. Bleach, drain cleaners, ammonia, and oven cleaners are strong chemicals that are often labelled with the signal word "Danger". Please note that even natural plant-based eco-friendly products can still be dangerous to human health - so read the labels of all heavy-duty cleaning products carefully! 'Warning' on a label means that the product is mildly to moderately toxic. It won't kill you if ingested or inhaled, and shouldn't cause any lasting damage IF first aid instructions are properly followed. In most cases, results of contact, inhalation or ingestion are unpleasant but not permanent. Many laundry and automatic dishwashing detergents, disinfectants and all-purpose cleaners fall into this category. 'Caution' on the product warning label is sometimes used interchangeably with the signal word 'Warning', but sometimes indicates that the product is less harmful that one labelled 'Warning'. Because you can never be completely sure, it is best to carefully read and follow all the cautions for use on the label and first aid instructions if there are any. 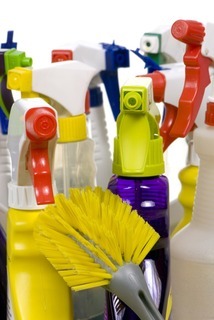 Some food chemicals commonly used for cleaning, such as vinegar, would fall into this category if they were sold as cleaning products and required human safety labels. The Soap and Detergent Association, as well as manufacturers of cleaning products, assure us that the household cleaners they make and distribute are safe if used as directed. This means that is the label says 'wear rubber gloves' - you should wear rubber gloves, not just because you might get a skin rash, but because you might absorb toxins through your skin. It is says - avoid inhaling - it is not just because it might make you cough, but because it might damage your lungs. Therefore, if you are one of the millions of people worldwide who prefer to use the common retail cleaners found at your grocer's - please, for the good of your health - follow the directions. Caustic products can cause chemical burns on contact or if inhaled. The product warning label will say words like "Corrosive', 'Danger' and 'Poison' because they can be fatal if ingested or inhaled. Read the warning labels carefully and replace with less dangerous products whenever you can. Usually this product warning label is there to let you know that it is not a good idea to inhale the fumes from this product. There is no strict definition of how to achieve 'adequate' ventilation for every product, so if you really need to use such products, be extra careful. These products may not be 'toxic' in the strictest sense, but may produce a hay-fever like reaction - itchy, water eyes, runny nose, irritated throat or redness of the skin. Many cleaning products contain hazardous checmicals that may be dangerous to human health and/or the environment if not carefully stored and disposed of. If you need to dispose of unused cleaning chemicals, the safest way is always to take the products in their original containers, or clearly-labelled, to your hazardous waste dump. Never dump chemicals into the street. Anything dumped into street drains often goes straight back into the groundwater with minimal or no treatment. These words on the product warning label are an important warning that mixing even small amounts of this product with other products listed could result in extreme danger to your health, or even death because of the chemical reactions that occur. Always heed these warnings!